A year ago Mr. Afthead was just coming through the second major depressive episode of our marriage. Two years ago he was a shell of his normal self, both physically and mentally, and our family was in a pit of trying to survive. Today he is in England on a work trip he found out about on Thursday when he was on another work trip in San Diego. I wish I had some kind of time telephone so I could call two-years-ago me. I’d tell her that not only would my husband get better, but that he didn’t have to quit his job, that they actually ended up being great to him through his depression and recovery, and today they had enough faith in him to send him on a huge business development trip to another country. Two years ago me would have liked to hear that news. It would have helped. I’m so grateful we weathered that storm. All that said, right now me is aggravated because my husband is the person in our family who does the dishes and takes out the trash, and he’s been gone for a week and just left for another week. 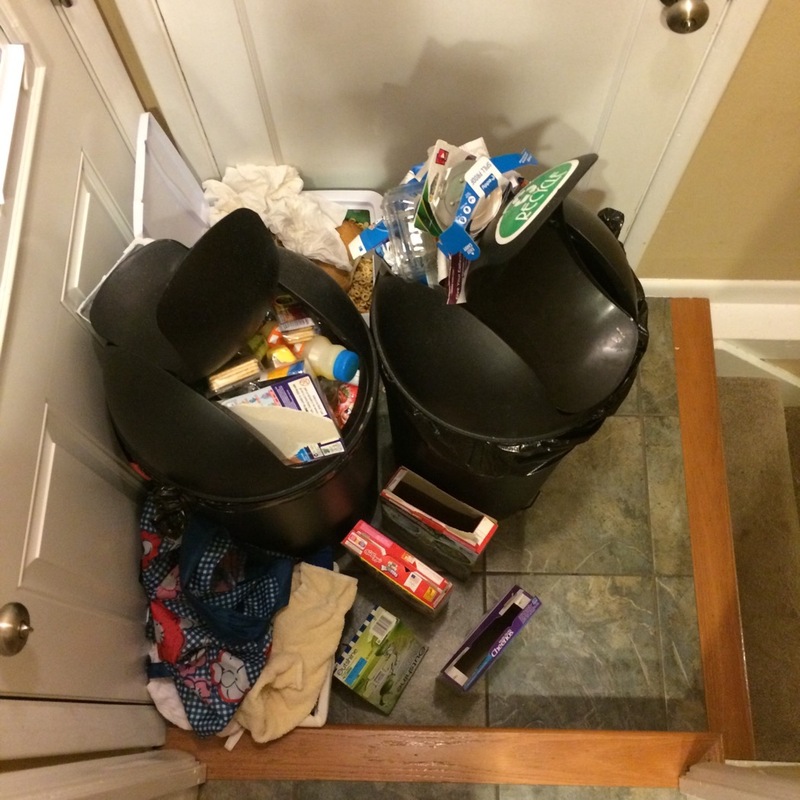 I have been patiently stacking dishes in the sink and responsibly sorting trash into recycling, compost, and trash. (We Aftheads are very trash savvy.) Imagine my annoyance when I went to go balance one more empty box in the recycle bin. I’d already left a trail of cereal boxes to the recycling bin so the trash fairy could easily find the problem and resolve it for me. Then, you go around the corner and the dish fairy is also completely shirking his responsibility. Gross dirty dishes fill the sink. 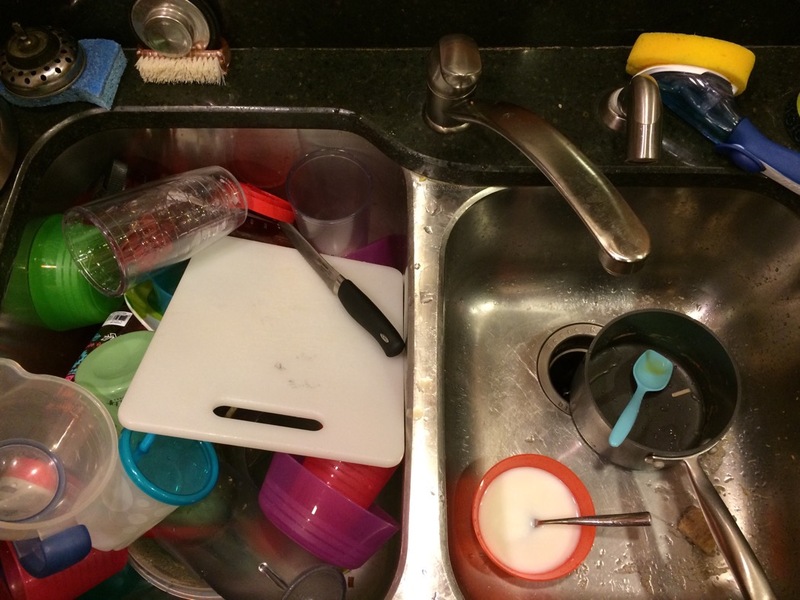 The dishwasher is full of clean dishes that the dish fairy has not yet put away. I ask you, what’s a person to do? Let me tell you, this person may or may not have thrown all her dishes away in college because they got too gross in the sink. To be fair, that may or may not have happened twice. Then it hits me. The trash and dish fairy was out of town. He was home for less than 48 hours, and he left again. While home he took out the compost, thank you very much Mr. Afthead, but that was all. If I didn’t take personable responsibility for the recycle mountain, trash mountain and dish mountain they were going to grow to epic proportions. And if trash mountain kept growing and dish mountain got gross enough I would have no nuclear option. “Oh no honey, I have no idea where the plates and silverware went. Guess we’ll just have to buy new ones.” Little shrug and grin as the trash bag jingles and clanks on it’s way to the curb. So this morning I took action and took out the mountain of recycling. Of course the recycling bin outside was almost full so I had to touch a bunch of gross trashy stuff to get it all to fit. (The trash fairy never complains about all the trashy bits sticking to him and sometimes doesn’t even wash his hands after.) Then I unloaded the dishwasher, bleached the straw that had a dead earwig on it – GROSS – and loaded the dishwasher, for the first of many loads. Little Afthead and I will unload the washer together tonight and then I’ll load it back up. I’d have her help me do the dishes, but you never know what kind of creatures are lurking in a sink of dishes left for a week (LIKE SAY AN EARWIGS). I’ll get it all taken care of this weekend, so the mountain can start growing. That way when the gloriously sane Mr. Afthead returns from England on Friday he’ll have something to do. I mean, other than being jet-lagged. He’ll probably be missing those trash bits anyway. that’s a great story– how your husband recovered and the family supported him. and now you have a wonderful dishwasher! seriously, it is good to read depression stories with a happy ending. Thanks. Mental illness is just a crazy beast, but I’m so grateful we have it at bay right now. Thanks for the compliment and the read! Ew! Did you say “mental illness is just a crazy beast”? So poetic. I really like how you just kinda threw in the fact that Mr. Afthead suffered from depression as if he had a cold. For some reason, that part really made the whole story even more real to me. Did I say that “crazy beast thing”? Nice…. not sure how I feel about my imagery there, but let’s go with it. My husband’s mental illness is all consuming when he is in it, so when we are out of it I tend to downplay the episodes as much as possible. I have really felt the relief lately that this round is over. He is well and thriving and I can be upset that he’s not taking the trash out. Yay for totally normal household annoyances! Well, first, I just hate it when my dish fairy is out of town or off duty! I wanted to let you know how much I’ve been enjoying your blog. To let know just how much I’ve nominated your for a Liebster award. You can see the details at http://socratesunderground.com/2015/08/11/humbled-and-honored-the-liebster-award/. I hope that you will accept!